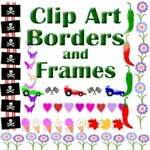 Colorful butterflies and green vines clip art to make beautiful butterfly borders and page dividers. Great for scrapbooks, paper crafts, collage or card making. Pink, purple and salmon colored butterfly border matches our special butterfly border frame note paper. Click small border graphics to enlarge.